Award-winning Dutch novelist Thomas Olde Heuvelt is the author of five novels and many short stories. His work has been translated into several languages, including English, Chinese, Japanese, Italian and French. In 2015, his story, “The Day the World Turned Upside Down” won a Hugo Award. Two more of his stories have been nominated for both Hugo and World Fantasy Awards. Hex, his latest novel, is a bestseller in The Netherlands and is now available in English. Warner Bros. is currently developing a TV series based on the book. Rachel Cordasco: What is it about dark fantasy and horror that draws you to these genres? 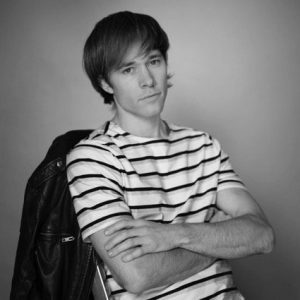 Thomas Olde Heuvelt: As a kid I used to collect model airplanes. You know, the ones you have to glue together from scratch, then paint all the way. It took me days. When it was done, I took a sledgehammer and crushed the plane right through the middle. I burned the edges with matches and used burnt cloth and wrinkled aluminum foil to simulate wreckage. Then I placed my toy ambulances around the crash scene and showed it to my mom. I was, like: Tadaaaa! She wasn’t amused. I guess this proves that I’ve always been drawn to the dark side of things. Hey, at least I didn’t poke the eyes out of my teddy bears. RC: You’ve cited Stephen King and Roald Dahl as important influences on your work. Did you read them around the same time (as a kid), or did their connection in your mind arise only later? TOH: Dahl was a bit earlier. You can imagine me going around the house after reading George’s Marvellous Medicine, emptying all my mom’s make-up and shoe polish and shampoo in my magic potion. Then I was twelve and read Stephen King’s Pet Sematary. By then I was at an age where I didn’t mimic everything I read about in real life. Lucky mom, lucky me. But of course, it was a natural evolution to grow into books like Stephen King’s, and then Clive Barker’s, and then Peter Straub’s, and that was about it as to what you could find translated into Dutch in that genre. We don’t have our own tradition of horror literature – we’re too down-to-earth for that, I guess. But the upshot of being Dutch is that you’re taught to be fluent in several languages, so that problem was solved at about age sixteen. 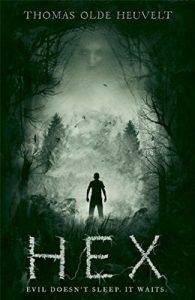 RC: Your latest book, HEX, is the first of your novels to be translated into English. Did you have any particular source of inspiration for this thriller? TOH: I wanted to write a story about a witch ever since I was traumatized by Roald Dahl’s The Witches, and the 1990 movie adaptation of it. The moment when Anjelica Huston, the Grand High Witch, takes off her mask… man, I was seven years old, and I didn’t trust any women for the next six months. Imagine what my winter was like, with women wearing gloves all the time. I saw witches everywhere. Then I watched The Blair Witch Project when I was fifteen, and of course, the scary part there was that you did not see the witch. Katherine van Wyler, the witch in HEX, has influences of both. Of course she has this horrible, disfigured face because her mouth and eyes are sewn shut… but for exactly the same reason, you never really get to see her. If you can’t see someone’s eyes, you’ll never know what they think. That makes her so scary. RC: How closely do you work with your translators? And has having a worldwide audience changed/influence how you develop your ideas for stories? TOH: Very close. Nancy Forest-Flier did an absolutely wonderful job in translating the novel, but as I have done with my translated short fiction so far, I completely rework the translation into my own voice in English. Which may deviate from my Dutch voice, so it has nothing to do with the quality of the translator. It’s like a full rewrite. Then Nancy and I worked together on editing the whole text, which was a lot of fun to do. I think it has become a better book because of it. As I’m pretty much fluent in English, this is something I can gratefully do. But now HEX has been sold to publishers in all these other countries like China, Brazil, Turkey, Ukraine… whose languages I don’t speak. I guess you simply have to thrust the translator and publisher. I had a short story out in Chinese once and the only thing I recognized was my name at the top of it. RC: If you’re willing to share, what are some of your long-term writing plans? TOH: I’m in the last act of a new novel, called Hidden Faces, which I’m thrilled about. It’s a scary book about good people who end up in a really bad situation, about mountains, about possession, and about how we deal with the forces of nature. This is, compared to HEX, the other book I always wanted to write: I’m an avid mountaineer myself. After that – I have enough ideas to pace up to a novel a year – that’s a personal writing goal for me.